The rankings and brand values were determined by Interbrand, the world’s premier brand ranking organization. 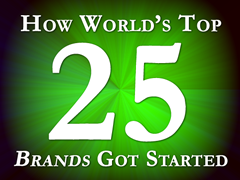 If you want to find out more about how they ranked 2010’s biggest brands, you can do so here. How it started: As a pharmacist, John Pemberton concocted a syrup and carried a jug of it down the street to a local pharmacy. The clerk thought it was excellent and put it on sale for five cents a glass. John advertized in The Atlanta Journal and placed hand-painted, oilcloth signs reading “Coca-Cola” on store awnings. He proceeded to sell nine drinks per day his first year. Today they sell 1.6 billion servings every day. How it started: The US Government expected the 1890 census to take 13 years to complete due to an immigration boom in the 1880s. Inspired by train conductors punching holes in railway tickets, Herman Hollerith invented the tabulating machine which recorded data on a machine readable medium. The US Government used his invention and tabulated the 1890 census in one year. He founded the company in 1896 which, after a few mergers, became International Business Machines (IBM) in 1917. How it started: In 1968 at the age of 13, a local company gave Bill Gates and buddy Paul Allen access to a computer. They were quickly banned after hacking the system and crashing the files. Soon thereafter, the company hired them to find bugs and fix weaknesses in the system. Bill and Paul were compensated with unlimited computer time. Over the next five years they received sporadic programming gigs until Gates went to Harvard in 1973. One year in, Paul convinced Gates to drop out because the PC business was about to explode and PC’s needed software. “Micro Soft” went through some rough first years, but eventually they licensed the MS-DOS operating system to IBM. The IBM PC took the public by storm and so did Microsoft. How it started: In 1995, Sergey Brin and Larry Page met at Stanford when Sergey was assigned to show Larry around campus on Larry’s first visit. A year later, as computer science grad students, they started collaborating on a search engine they called BackRub. Eventually they changed the name to Google, originating from the term “googol” (one followed by one hundred zeros). It ran on Stanford servers for one year until it started taking too much bandwidth. In 1998, Sun co-founder Andy Bechtolsheim wrote them a $100K check to hire their first employee. They set up shop in a friend’s garage. Soon the project was interfering with their schoolwork and they tried to sell it to Excite for $1 million. Excite rejected the offer. A year later, they received $25 million in funding. How it started: In 1968, Gordon Moore and Bob Noyce left their electrical engineering jobs to start a company that made memory chips and microprocessors. Their first attempt to name their company involved putting their names together, Moore Noyce. The name, however, was a homophone for “More Noise” which was ill-suited for an electronics company. They switched to Integrated Electronics or Intel for short. They took a risk from the start. Bob invented an integrated circuit that enabled the miniaturization of electronic circuitry onto a single silicon chip. No one else was using silicon at the time because it was 100 times more expensive than the alternative. They created a product ten years before there was demand for it. Much like Microsoft, they hit it big when IBM chose to use Intel’s revolutionary chip for the IBM PC in 1981. How it started: In 1865, Nokia started by making paper – one of the original communications technologies. Fredrik Idestam built a wood pulp mill on the banks of the Tammerkoski River. An engineer by trade, Fredrik developed a new, cheaper paper manufacturing process that revolutionized the paper industry. His big break was winning a bronze medal for this invention at the Paris World Exposition in 1867. How it started: Bill and Dave met as students at Stanford. After graduating in 1934, Dave moved to New York to work for General Electric while Bill finished up graduate work at Stanford. In 1937, Dave visited Bill in Palo Alto. Their first official business meeting convinced Dave to take a leave of absence from GE. In 1939, they moved into the HP Garage and built their first product, an audio oscillator. One of HP’s first customers was Walt Disney, who purchased eight oscillators to develop and test an innovative sound system for the movie Fantasia. How it started: In 1924, Sakichi Toyoda invented the Toyoda Model G Automatic Loom to efficiently manufacture textiles. The Japanese government encouraged Toyoda Automatic Loom Works (Sakichi’s company) to develop automobiles a few years later. So Kiichiro, Sakichi’s son, travelled to Europe and the US to investigate automobile production. How it started: After a slew of acquisitions, mergers, hirings, and firings, Franz Josef Popp founded and headed Bayerische Motoren Werke AG (BMW) in 1916. They started producing the world’s leading aircraft engines for planes in World War I. The company’s logo was designed to replicate a rotating propeller. After World War I, BMW was forced to cease aircraft engine production by the Versailles Armistice Treaty. They consequently shifted to motorcycle production in 1923 and automobiles in 1928. How it started: At age 21, Jobs managed to interest an old friend, Wozniak (age 26), in selling a machine that Wozniak had built, the Apple I Computer. In 1976, Jobs approached a local computer store. The owner said he would order 50 of the machines and pay $500 each on delivery. Jobs took the purchase order to a national electronic parts distributor and ordered the parts he needed. He told the manager that they were going to build 50 computers in 30 days. Then the computer store was going to pay him $500 apiece, at which point he could pay for the parts. Impressed by Jobs’ tenacity, the manager agreed. Over the next month, “The Steves” and their small crew spent day and night hand-building the computers. They delivered them on time and paid for the parts with a decent profit left for their next order. By working in a garage, selling prized possessions (calculators and a VW van), and scrounging, they were able to build and deliver another 150 Apple I’s over the next year. Jobs managed to fund Apple Computers without giving away a cent of ownership. The third founder, Ron Wayne, joined them after the first 50 were sold but eventually sold his ownership back to “The Steves” for $800. At this time, all cigarettes were pretty much the same. Philip introduced the Marlboro as a woman’s cigarette with the tagline “Mild as May” and a printed red band around the filter to hide unsigthtly lipstick stains. How it started: From a young age, Soichiro was fascinated by automobiles. Growing up, he had worked in a mechanic’s shop where he tuned cars and entered them into races. Shortly, he began working on a new piston design that he hoped to sell to Toyota. His first design was rejected. In the 1930s, Soichiro sold his wife’s jewelry and went back to school. Eventually he won-over Toyota and opened a factory to construct the pistons, but it was quickly destroyed by an earthquake. Because of World War II there was a gasoline shortage and he couldn’t drive his car. So Soichiro came up with a novel idea to attach a two-stroke to his bicycle. He got funding from bicycle shop owners across Japan and built the Honda Cub motorcycle. Honda was the world’s largest manufacturer of motorcycles by 1964. How it started: Edward F. Codd’s paper, “A Relational Model of Data for Large Shared Data Banks” sounds like an afternoon bedtime story to most of us, but not Larry Ellison. He read this report in 1970 and it opened his eyes to an incredible opportunity in relational database management systems that would change the business world forever. In other words, Larry was going to help businesses organize and keep track of their data (e.g. customer contact info, inventory, accounting, etc.). Seven years later, in 1977, Larry co-founded Software Development Laboratories (SDL) with Bob Miner and Ed Oates. Three name changes later, Oracle Corporation is the world’s largest supplier of business enterprise software. How it started: In 1898, a pharmacist and drugstore owner named Caleb Bradham invented the recipe for a new fountain drink that he called “Brad’s Drink”. Caleb sought to create a drink that was refreshing, aided in digestion, and boosted energy. It included a blend of kola nut extract, vanilla, and “rare oils”. He started by having his assistant taste it. Then he sold it in his store. After 20 years of success, Caleb gambled on sugar prices believing they would continue to rise after WWI. They didn’t. He lost everything and Pepsi-Cola went bankrupt in 1923. Caleb sold Pepsi-Cola to Loft Candy Company in 1931 and it continued to struggle partly because Loft reformulated the recipe. Loft tried to sell Pepsi to Coca-Cola on three occasions but Coke refused each time. In 1936, Pepsi hit it big again with the introduction of a 12-ounce bottle (previously six ounces). They sold it for five cents, the same price of a six-ounce bottle of Coke, and appealed to price-conscious consumers after the Great Depression. At the end of 1963, he took an order of 200 shoes from Onitsuka Tiger. He stored the inventory in his father’s basement and peddled the shoes out of the back of his car at track meets. Microsoft and Google were two of the 10 World-Class Companies Started by College Students.